The Juice Solution shows how to unleash the powerful health benefits in raw fruits, vegetables, and nuts by turning them into delicious juice concoctions, to help you feel your best. With over 90 recipes, you'll find juices to help you energize, fuel, detoxify, and protect your immune system. Learn how to make the most from your electric juicer and start feeling like your healthiest self. Consuming produce in juice form preserves nutrients that would be otherwise lost in the cooking process and provides a quick and easy way to enjoy your daily dose of fruits and vegetables. 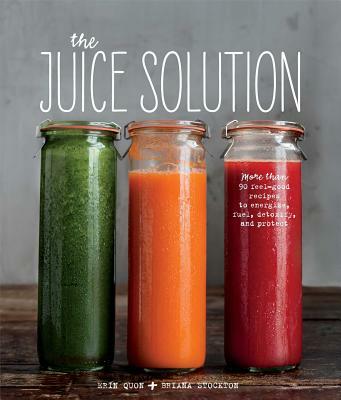 Organized by different nutritional needs, this book offers a collection of juice recipes for any time of day. Energizing juices help wake up your system without the use of stimulants like caffeine. Fueling juices, made from fibrous ingredients and foods rich in healthy fats, help keep you satisfied and can be enjoyed in place of a light meal. Detoxifying juices flush toxins from your body by releasing the natural antibacterial qualities found in many fruits and vegetables. Protective juices unleash the immune-boosting properties in certain types of fresh produce. Guides to choosing an electric juicer model that's right for you, selecting produce to target specific health needs, and tips and trips for making the most of your machine round out the book. Whether you're a first time juicer, an avid juice cleanser, or just looking for fresh and exciting ways to use your home juicer, this book offers something for everyone whose looking to feel healthier.